I come from a mushing family. On my Mother's side my great-grandfather, Frank Ryan, an Inupiat Eskimo, delivered U.S. mail from Unalakleet to other villages by dog team. On my father's side my grandfather Joe Redington Sr. started the Iditarod in 1973. He has raced in the Iditarod 19 times. 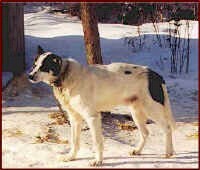 1997 was his last Iditarod and he finished 36th place out of 54 mushers at 80 years old. My father, Raymie, has ran in 11 Iditarods and my uncle, Joee, ran in two Iditarods. My brother Ray and his wife, Julia, have both competed in the Jr. Iditarod before. Now they have 30 dogs of their own and race in mid-distance races. Both my uncles, Joee and Tim, compete in sprint racing. 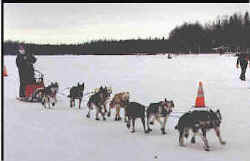 I plan to continue our family tradition in racing in the Iditarod once I turn 18 years old. I have been racing dogs for a long time. I been involved with dogs my whole life and I have raced in three Jr. Iditarods. My first year I finished in 6th place. My second year I had bad luck and broke my sled. I couldn't continue on after that. My third year I won the 1999 Jr. Iditarod. My initial interest in running dogs is that is a family heritage and I love it, and in the near future I hope to be competitive in the Iditarod. My main mentor is my Dad. He is a very good coach. I love training and watching him every chance I get because I learn more and more from him. At our kennel we have 110 dogs. The most important considerations in housing sled dogs is that it takes a lot of hard work and you have to have love for your dogs. If you don't, things will not work out as well. In our feeding program our dogs usually get fed twice a day and flavored water also. My whole family helps feeding and watering our dogs. It is like all of the dogs are a part of the family. In the winter we might hire a handler to help. The breed we work with is mostly Alaskan huskies. The physical characteristics that I look for in our dogs is attitude--dogs that love to run, are good eaters, and light workers (light on their feet). The mental attributes that I require in our dogs is that they must love to go at all times and know when to rest and when not to rest. My favorite dogs are my leaders, Doc and Spot. They are very intelligent dogs and are the heart and soul of my team. I ran in 7 junior races this year and I was undefeated in all of them with Spot and Doc in lead. The criteria we use for breeding stock is that we pick a dog that loves to go all the time, they must eat well and must be a fast dog. Before we train our puppies we let them follow us on a four-wheeler and then we start training them at about seven months old. The most important thing that I look for in a young dogs is that he/she must love to go. At the point where I decide a youngster is likely to make it in my racing team is that I see where it has the speed and will to go. The pup must have ran in races with the puppy team before though. My training/racing philosophy of my dogs is to train fast and have light workers. I train hard in November and December and then go on with shorter training runs. This way none of our dogs will get hurt on any training runs before a big important race. My training goals for my team is basically go fast and have lots of fun. The most important thing in training for my team is to go on a 40 mile run with out getting tired. Once I know they can handle that, I know my team is ready to race over 150 miles. I pick races that I know my team is ready for. I train hard for the Jr. Iditarod and other races that my team and I do. I think my strengths as a racer is that I want to win and I can run at anytime to help out my dogs out. I know when to push them and when not to and when to snack and give them a rest if they need it. My weaknesses is that I do not have a lot of sponsors and it is hard for me to afford the technology now that it takes to be competitive. 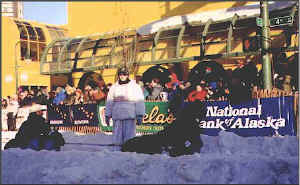 Ryan representing the Honorary Mushers in the 1999 Iditarod. My mushing career goal is to be the first Eskimo to win the Iditarod. I think you have to have the will to win, the confidence and you must know your teams capabilities to win a race. My vision of the future of sled dog sports is that it is going to get bigger and bigger. I think soon you will have to qualify to enter a big race like in car racing, and soon they will pick like only 20 or so to compete in the Iditarod and in the Fur Rondy. 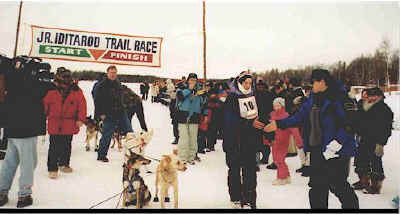 I think my most memorable sled dog experience was when I was racing against my Dad and when I beat him in the Ship Ahoy 50/50 mile race [photo], and this year, when I won the 1999 Jr. Iditarod. This year I started out number 10 in the record field of 22 mushers in the Jr. Iditarod. I started out at a slow pace for the first 15 miles. The main reason for that is because I wanted to let my team know that I wanted them to save their energy and I didn't think that the race was going to be won in the first 15 to 20 miles anyway. This year it was 170 miles long. About 35 miles into the race we started to pick up the pace. By then we had already passed a couple teams and were gaining on others. I caught up to Ben Gray of Palmer about then and ran with him for about 20 miles. His team looked good and was moving real well. We snacked our teams together about 40 miles out. There was a lot of heat so we snacked them with flavored ice. The snacking only took about 2 minutes and we were off again. I left Ben and my team wanted to pick up the pace more and by then my whole team was in a lope. By the time we got to Eagle Song Lodge, a sign-through checkpoint, I was happy. I caught up to Danny and Tryell Seavey there and ran with them the next 18 miles to Yentna, the half way checkpoint. I pulled into Yentna the same minute that the Seavey boys did and then started to do my mandatory 10 hour layover. I snacked and watered my dogs as soon as I could. I was snacking my dogs when Wendy Warren pulled into Yentna. She had a very fast time there and was leading the race. She was 6 minute faster than me to Yentna. They sorted out the time deferential and she left 6 minutes before me. I was in second place and I was very happy with my dogs. They looked very well and I was happy. The Seavey boys were 3rd and 4th. They were about 15 minutes behind me when we left Yentna. I watered my team five times at Yentna before we left to return for the finish line. When we reached Eagle Song Lodge I saw where Wendy had picked up two minutes on us. I whistled my leaders up for speed and it took about 10 miles and Wendy was in sight. Wendy's team looked very good. I followed her for 20 miles before I passed her. She followed me for about another 15 miles. We both switched from our boots to shoes so we could help out our teams better and pick up the pace more. My team was very strong on the way back and we kept our lead to finish in 1st place. It was a great victory for my team and me. I can't wait for next year's Jr. Yukon Quest and the Jr. Iditarod. I look forward to those races and I have already been training them for the last 8 weeks. I train my dogs every day now. My advice to a beginner musher is not to rush everything. Get about 6 or 8 dogs and see how you like it before you get up to 40 or more dogs. If you do not do well racing at first, try to figure out what your problem was. Ask many other racers what they think and then just try your best and see what they do in training. Don't worry, maybe you can fix it for other races later on. When training just try to have fun and don't worry if you lose your team or anything. I think we have all done that so do not worry. Best wishes to all of you beginners. I would like to thank all the volunteers who have helped in all the races. You guys make it all happen for us and we sure do appreciate it a lot. Thanks again to all of you.